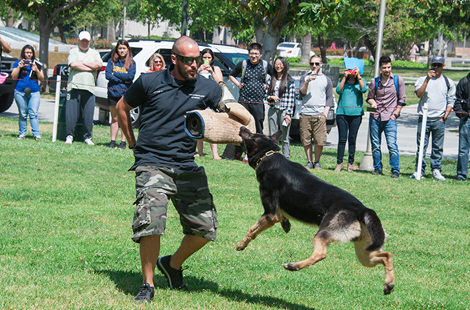 Police dogs displayed a wide range of skills in a recent on-campus K-9 law enforcement demonstration. Read more about the K-9 event. Since 1969, the Chicana/o studies department at CSUN has been connecting students to Latino heritage. The anniversary celebration gave a look back on where the department has been and a glimpse to where it’s going. Read more about Chicana/o Studies. The historic CSUN Orange Grove, one of the last of its kind in the San Fernando Valley, saw students, staff, faculty and community volunteers pick fruit for local food pantries. Read more about the harvest. Thurs., April 24, 6:30 p.m. Sat., April 26, 12 p.m. The 29-19 Matadors host the first-place 49ers. Fri., May 9, 8 p.m.
An evening of fun and sidesplitting laughter. Please join us for a panel discussion between faculty from CSUN and UNAM, celebrating the 100th anniversary of the poet-diplomat’s birth. Help CSUN’s National Center on Deafness celebrate its 50th year at its annual Sign-N-Run Festival and 5K to benefit the center. Share in the fun with games, exhibits, kiddie events and entertainment! A dynamic group of CSUN alumni are starting a new chapter focused on building a strong network of CSUN attorneys. Come mix and mingle with other Matador attorneys at El Torito Grill in the Sherman Oaks Galleria. VPAC’s Thor Steingraber: Can Opera Become a Sustainable Art Form?